The two images on this album spread show the processional at this Black Creek Pioneer Village wedding. 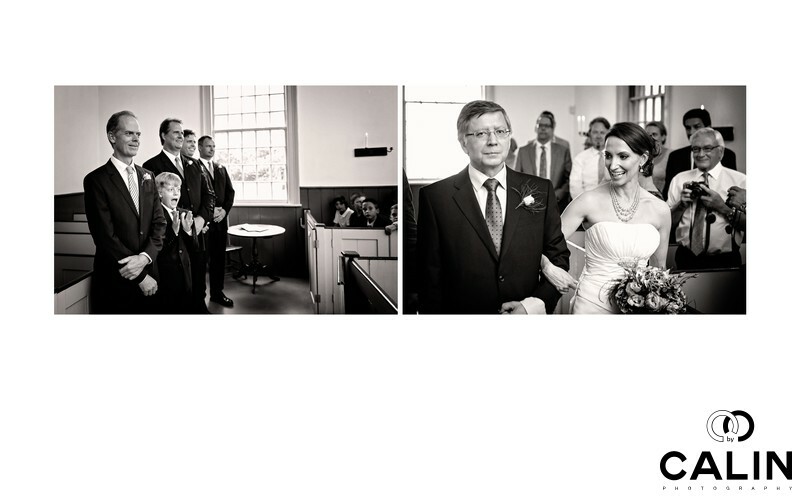 The image on the left was captured inside of the wedding chapel and is featuring the groom and an over joyous son of the bride. The happiness in this image is almost palpable. First, this photo captures the groom's emotions magnificently. He is smiling while looking at his bride walking down the island. Next to him, their son is clapping and yelling at the bride's sight. Finally, in the background we see the groomsmen (groom's brothers) and guests smiling. The second photo of this Pioneer Village album shows the father of the bride escorting his daughter to the altar for her wedding ceremony. The father is visibly emotional on his daughter's big day and the photo catches him in a unique posture. He is half smiling, half tearing which ads power to the album page. In the background we can see a few other characters. First, we have the guest hobbyist photographer, who has to take the shot as the bride passes. Also, we can see the other friends and relatives of the bride smiling as she walks toward the altar. As usually, for these types of emotional images I applied a fine art black and white processing. Black and white is a well-kept secret of wedding photography. I find that for candid photos taken during the ceremony black and white just works perfectly. While the venues and banquet halls generally have good lighting, often wedding chapels lack the quality and the direction of light. In such cases, black and white wedding photography with some additional grain is the answer.